"I came back jazzed from [your] meetings this past weekend. Answered a lot of questions for me, specifically about the seeming randomness of healings. I have done so many healings in so many places under so many different circumstances and in so many different ways … but I have no idea what I'm doing, and I don't know why it works here and not there! I can't just turn it on like a switch. I will never forget as long as I live praying my guts out, storming the Throne of God over a baby with Malaria out in the back country of Kenya, only to hear that he died that afternoon on the way to the clinic. And then turn around, not even expecting anything, and heal a whole line of people without even trying. Go figure. Or walk past someone, say a quick prayer, and bingo!, they're healed of some weird life-threatening disease. Sometimes I can feel the flow of the Spirit like a river of oil, sometimes like electricity, and sometimes like a sense of just regular power … and then sometimes I don't feel a whisper of anything, like I'm not even part of the process, but stand and watch some incredible thing happen. Those were some big questions for me, and [you] made a lot of points that really help settle a lot. I'm looking forward to the next sessions. I am bringing my family this weekend. I want them to see the real thing in action. My kids have heard the stories of miracles and my wife has been there for a few of them, but to witness in action the power of the simplicity of the Word of God is something they really need to see and hear for themselves. Thank you for the invaluable teachings you have given. There is so much more I want to learn from you." We are thankful to the Lord that we can be a help and blessing even to someone like Dale. 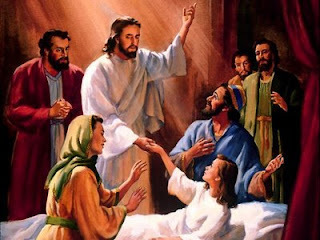 One thing the Lord revealed to us has been especially helpful to God's servants---the difference between the gift of healing (which I believe Dale has been given) and the very different authority to heal. The gift of healing can be mysterious, unpredictable, instant, and all-or-nothing---as Dale attests above. But the authority to heal is generally the very opposite. It is generally predictable and consistent and can involve a step-by-step process of "moving a mountain into the sea." Few have the gift of healing as powerful as Dale. But every believer has been given a measure of authority to heal the infirm and cast out demons for the purpose of witnessing for Jesus Christ and sharing the gospel to the lost. When we understand it in this way, the uncertainty and "mystery" surrounding the ministry of healing are taken away. Thank you for partnering with us so effectually, dear ones!